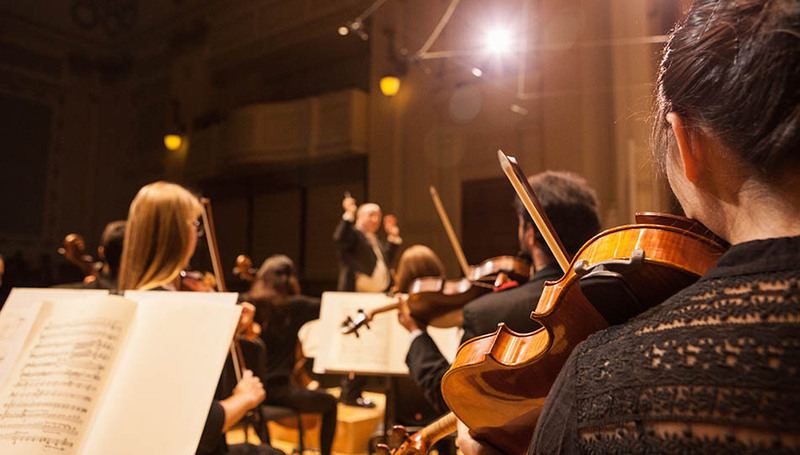 We’ve put together a list of must-know information for your audition at SFCM. Be sure to check out the list below to see what’s in store for you on audition day. There is limited parking in the neighborhood, so it may be easier to arrive by public transportation. We are on the MUNI line and a 10-minute walk from the Civic Center BART stop. Arrive at 50 Oak St and check in with security to gain access to the building. Check in with the admissions team at the welcome table on the café level. Be sure to find out about the information sessions and tours that will be going on throughout the audition day when you check in. You can expect to spend most of your day at SFCM. Warm up in your designated warm up room. Arrive 15 minutes before your audition time at the designated audition space. The audition panel will likely say a few words of welcome to you, and they will often allow you to choose the first piece that you perform. After your first selection, the panel will then choose the additional material that they would like to hear. The panel may stop you in the middle of one of your selections due to time restrictions. Please do not be concerned if you do not have the opportunity to perform all of your pieces from beginning to end. Be sure to check your handout for information session times, tours, and meetings with current students. Take time to explore the area around the Conservatory (i.e. Hayes Street) and enjoy the city. ​You will be notified of admission decisions by March 15 if you are a graduate student or by April 1 if you are an undergraduate student. Feel free to sit in on classes and rehearsals while you are here in San Francisco. Check our performance calendar to see if there are any SFCM concerts or recitals you would like to see. Depending on their availability, faculty are often willing to give you a consultative lesson during your visit. Contact them far in advance to schedule a lesson time while you're in San Francisco. You can find their contact information in their faculty profiles, or e-mail apply@sfcm.edu. Get out and explore beautiful San Francisco! Voice auditions are required to be accompanied. Voice applicants auditioning live or in New York City may select to use the SFCM-provided accompanist or opt out and provide their own. Voice applicants auditioning at other regional sites or by final recording must provide their own. Other program areas are not required to have an accompanist. May I change my audition repertoire? Live and regional audition applicants will receive an email in the week leading up to the audition with final details and the opportunity to change repertoire. Will faculty be present at my regional audition? Dimitri Murrath, Professor of Viola and Co-Chair Chamber Music Department, will be present at the 2019 Interlochen regional auditions. Catherine Cook, Professor of Voice, will be present at the 2019 New York City auditions on March 1. Both of these faculty members will be leading master classes open to all applicants and parents in the area in addition to hearing auditions. Reach out to apply@sfcm.edu if you are interested in attending. We are unable to have faculty at all regional auditions, so each audition is recorded for later review by faculty. Is it possible to have a practice space in the days leading up to my audition? We are unable to grant practice space before the audition date. We recommend reaching out to Village Music San Francisco to find a space at least 48 hours in advance. On the day of the audition, applicants will have a warm-up space leading up to their assigned time. Where do I stay while in San Francisco? Discounted hotel rates are available to current and prospective SFCM students from our partner, Kimpton Hotels. Please visit this link to search for availability.